Discover / fashion / Flares! 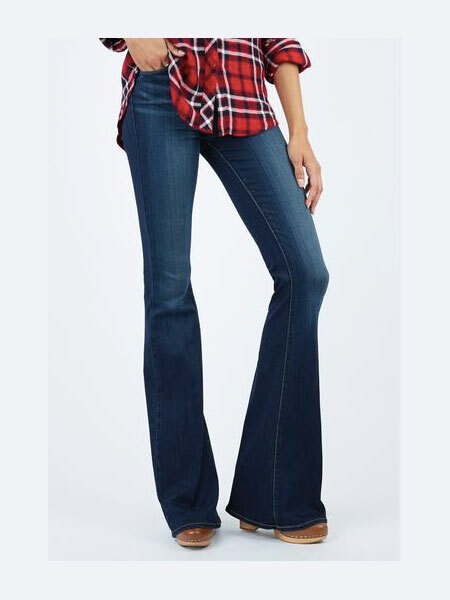 Many years ago, when my daughter was in middle school, I bought her a pair of skinny jeans for back-to-school. Those were the days of flares and she flat out refused to wear them. I promised her that they would be the Next Big Thing and that it’s more fun to be first than a follower. Silly I know, but hey, I spent most of my life ensconced in the absurdity of the fashion industry. Well, she WAS the first, and ever since that day, she thinks I have ESP when it comes to fashion. She’s a sophomore in college now, but she still asks me what’s coming in for fall, and I (secretly) love it. One fresh silhouette that I’ll be sporting this season is flares. I can’t wait to embrace the 70’s vibe; it was my high school era, after all! While no one is giving up skinny jeans without a fight (and you certainly don’t have to), I’m ready for a change. But here’s my advice. Make sure they’re a slim fit to the knee or a bit below, stick with a dark wash, and for footwear, choose a platform or (my choice) a clog. You need a bit of height to get away with this look. I particularly like this version by Kut from the Kloth with a comfy bit of stretch to the denim. Sized 4 – 14 at Ella Where She Shops for $97. Mention The E List and take 25% off one Kut from the Kloth item thru 9/30/2015.